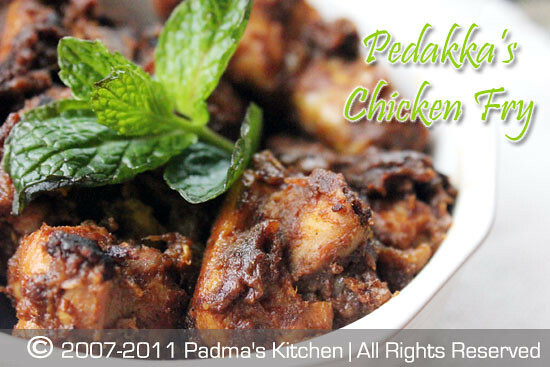 Pedakka's Chicken fry is one of my all time favorite recipes which I cook every now and then. My last year India trip gave me chance to learn some family favorites from my sisters, mother and Pedamma (mother's older sister). A little info about my Pedakka, Laxmi Akka is a great cook, likes to feed the whole family, we call her "Annapurna Thalli" one who feeds sumptuously. What ever way she cooks turns out so delicious. She tells us lot of tips and tricks in cooking and home remedies. She is like an encyclopedia for me, I always refer to her and my mother. This Chicken fry recipe is one from her recipe bank which I am darn sure that if you cook it her way turns out so good you will receive all the applause for it!! I promise you will never regret making this chicken fry at potlucks or gatherings. A simple yet tasty mouthwatering recipe is very appropriate for the coming Easter! I made this for our Sunday afternoon lunch last week along with Knorr's ready to cook Moghlai Biryani. If you ask me to review about this ready mix I will say its 1 out of 5, It is nothing compared to their Hyderabadi Dum Biryani ready mix they have. First and foremost cut the chicken into bite size pieces excluding the leg portions. Add turmeric powder to it, mix well and rinse with water. Heat oil on medium high, add bay leaves, 2"cinnamon stick, cloves and whole cardamom, let it fry till the aroma of the spices come out. To this add curry leaves, length wise slit green chillies and onions. Fry till the onions turn light pink in color. Add the cleaned and rinsed chicken pieces, fry for another minute so that all the spices and onions mix well with chicken. Add water, salt and place the lid, reduce the flame to medium low and let the chicken cook. it may vary from 10 to 15 mins. You will notice the chicken turns white and opaque then open the lid, turn the flame to medium high. Now add the ginger-garlic paste, cumin-coriander powder, garam masala powder, red chilli powder. Let the chicken cook still further till the water evaporates and lastly add paprika powder. By now the fry would turn dark brown in color and the chicken will be golden brown in color. You will know when its done! You won't resist to taste it at this stage. Check for salt and spices and add accordingly. If it is too spicy sprinkle some freshly squeezed lemon juice on the chicken fry. Enjoy this with any Biryani. I made Moghlai Biryani from Ready to cook Knorr Mix. 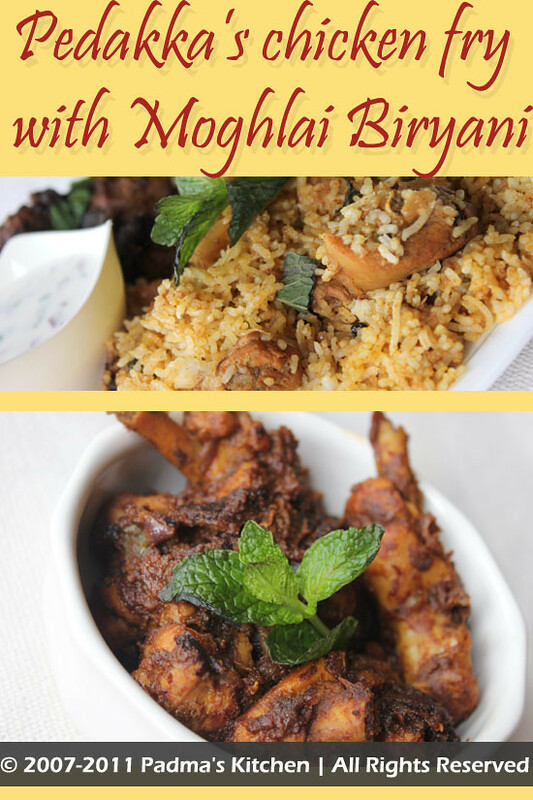 If you are interested, you can make simple Green Peas Pulav or Egg Dum Biryani from my blog (click on the titles to check the recipes). I am dedicating this post to my favorite Pedakka! Thanks akka for all your yummy recipes, love ya!! Omg, tempting chickey fry,mouthwatering here.. I never had a habit of posting comments at all. But after trying your recipe out I could not control myself to say thanx. The recipe is simply awesome. In a word to say the best of best recipes of mine so far. As this is the first time i tried some ups and downs were there, but im sure next time i can make it the best. I often go for this sort thick graviest fries only. Thats why i liked it very much. Chala chala bagundandi. I always try chicken fry like this only.